This delicious dish has a very original name “chilpachole" and it is considered a classic of the food of Veracruz. Apparently its origin comes from a French soup “soupe aux fruits de mer" that consists of a broth in which shellfish are cooked and then some vegetables are added. The Mexicans, upon seeing this soup, they made some changes. Instead of giving protagonism to the shellfish, they gave protagonism to the chilies and instead of accompanying it with vegetables, they accompanied it with shrimps – that’s how chilpachole was born. 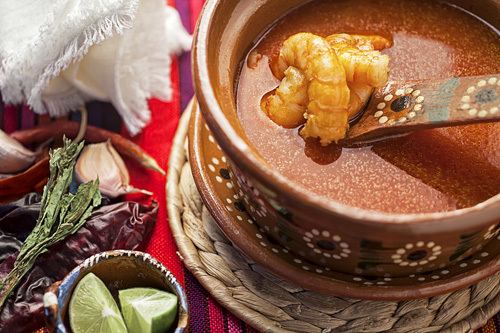 A thick soup that has a strong flavor but with the help of the shrimps the flavor becomes more harmonious. This dish can be served as entree plate and believe it or not it can also be served as snack in “shots" – typical of the Mexican cantinas. This recipe is a little complicated because many steps have to be followed. However everything is explained in detail so you won’t have any problem. The epazote, that is used in this recipe, is very important to give a very good seasoning to the soup. If the shrimps are bought peeled and deveined you will save some time. Total preparation time 30 minutes . This recipe serves 5 plates. Peel 1.1 lbs of shrimps. Remove the seeds of 1 arbol pepper and of 2 guajillo peppers. The Arbol Pepper with the one you worked. The 2 Guajillo Peppers with the ones you worked. Roast the griddle ingredients for about 2 minutes, until all their sides are moderately roasted; move them regularly with some tongs. Transfer from the griddle to a blender, with the tongs, the ingredients that were roasted. Cut 2 limes into wedges, put them in a ramekin and take it to the table. Heat in a saucepan over medium heat 2 tablespoons of olive oil. Pour in the saucepan the salsa that was blended and fry it for approximately 1 minute, until it acquires a more intense color; stir occasionally. 4 cups of Water (1 qt). Mix the saucepan ingredients and bring the broth to a boil over high heat. When the broth boils reduce to low heat and cook it for about 10 minutes, until it thickens a little and acquires a more intense color; stir occasionally. Add in the saucepan the shrimps that were peeled. Mix the shrimp chilpachole and leave it cooking for about 5 minutes, until the shrimps are well cooked and they turn to a pink color. Careful! Don’t cook the shrimps for a long time because their consistency will become rubbery and difficult to chew. When the cooking is done discard the epazote sprig. Suggestion This soup has to be accompanied with a Mexican beverage. Variation: The chilpachole can also be prepared with crab. Did you like the Shrimp Chilpachole? If you need guajillo pepper for the chilpachole – the Don Enrique chilies will give a very good flavor and color to your soup. Use these beautiful glasses to enjoy the chilpachole. To make your dish more Mexican serve it in Mexican plates.